Want to tow a car behind your RV? Then you’ll either need a tow dolly (to tow the car with 2 wheels off the ground) or an auto trailer (to tow 4 wheels up). Or you'll need to know how to flat tow a vehicle four wheels down. 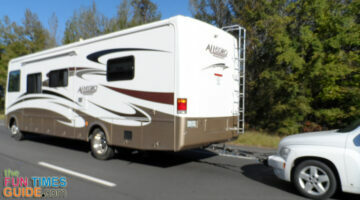 And if you want to take along boats, bicycles, motorcycles, or scooters then you'll need a toy hauler, a specialized rack, or an electric lift for your RV. Here, RVers show you how to flat tow a Jeep Wrangler... or any other type of toad for RVing. Plus everything you need to know about triple towing, double towing, flat towing, towing four wheels down, towing two wheels down, trailering a car behind a motorhome, and hitching a fifth wheel trailer to your pickup truck. When the RV trailer’s load isn’t spread out properly, disaster can strike without warning. Here are the best tips for avoiding trailer sway. Tips for stopping and braking when pulling a trailer, driving at highway speeds, and balancing your RV’s weight distribution. 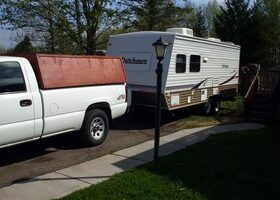 If you’ve never towed a trailer behind a truck or motorhome before, then read this first! Ever have a trailer breakaway from your hitch before? I have. Here’s how to properly mount and hook up a fifth wheel hitch on your pickup truck. If you own an RV and you enjoy camping, boating and/or fishing, then check out our best picks for small lightweight fishing boats that are easy to transport and store. We are planning to tow our 2004 Jeep Wrangler Unlimited behind an RV someday soon. Here’s what we’ve learned about towing four wheels down, and how to shift the transfer case into Neutral.